A nice groundsheet was donated to the LER museum recently which has a marking that I have not encountered before. I'm looking for info on the stamp "seconds". Does it indicate an item that is substandard? Was there are C arrow or broad arrow on the groundsheet ? 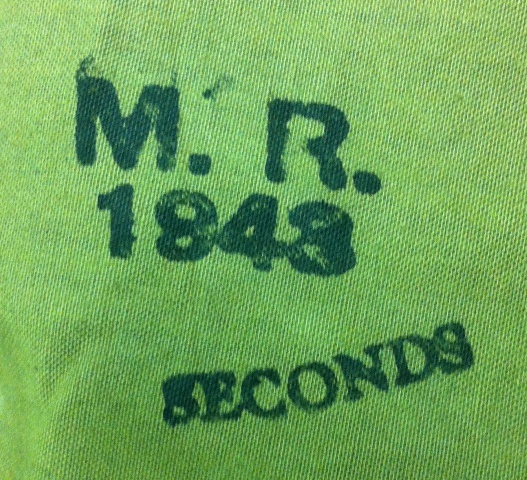 If not, the assumption that the "seconds" stamp could mean inferior would seem to make sense. I did not see the C broad arrow. Are you suggesting that it may have been sold on the civilian market? I'm not familiar with this maker either, but I'm willing to guess that the "R" stands for rubber, as I have seen many rubber companies involved in the production of webbing/canvas items. Also, it's difficult to say if it is Canadian or Commonwealth without the arrow. Infanteer wrote: I did not see the C broad arrow. Are you suggesting that it may have been sold on the civilian market? I would think without the arrow marking it would not be military issue .... It may have been sold to the civilian market or perhaps issued to CD personnel ? Just a thought ? I know in England helmets that did not meet standard had different holes punched in the brim to denote their level of quality. These I believe were issued to ARP and home guard units.